We’re thrilled! 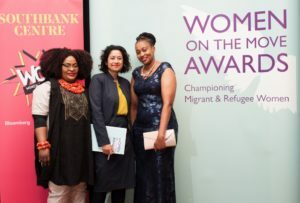 On Friday 9th March, two of our amazing centre users, Vee and Florence, were awarded the UNHCR/Migrants Organise Women on the Move Award. 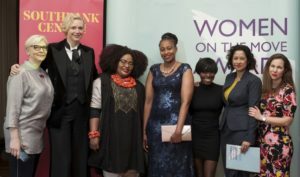 The 2018 Women on the Move Awards, presented by UNHCR, the UN Refugee Agency, and Migrants Organise, recognised exceptional refugees and those working on their behalf for their outstanding work in empowering women. They were given the award for founding Sisters United. This is the women’s group that Lora our Support Programme Leader started a few months ago at St. Augustine’s. It’s now constituted as a separate charity but obviously retains very strong links to St Augustine’s Centre.